Philadelphia Phillies former first baseman Carlos Santana is seen here during a game in the 2018 season. An ESPN report detailed how Santana had smashed a clubhouse TV after learned his teammates were playing the video game 'Fortnite' during games. Whatever happened to the theory that once the Eagles won the Super Bowl the city was supposed to enjoy a stretch of nothing but winning and warm sunny days? Despite the fact that spring officially arrived sometime on Tuesday, if you take a look out of your windows, or take a short walk anywhere, you will realize that March has morphed back January. With winter refusing to lessen its grip on Philadelphia, this column is intended as a public service message that the cold will eventually end and better days are soon ahead. The bully winds of March will be tamed before too long, so let’s take a look at what sits in the very near future. Barring total collapse, it appears that both winter teams are headed to the playoffs. And not just these playoffs, but many playoff seasons in the future, as the Sixers and Flyers are well into their rebuilds with strong casts of young talent. The Wells Fargo Center is going to be lit up with playoff games toward the month of May. But if you really want to think warm thoughts, consider what will soon be happening across the street at Citizens Bank Park. The Phillies are just a fortnight away from heading north toward what should be a much more interesting and successful spring and summer. Although there are warnings from the Phillies front office that the time for the club to be a serious contender remain in the distance, there should be every expectation that this edition of the Phillies has the stuff to at least hang in the playoff race until the Eagles re-start their season in early September. Throughout the spring, first-year manager Gabe Kapler has provided all sorts of entertainment with his quirky philosophies. Doesn’t matter that left field was vacant at the start of one game; doesn’t matter that players are only assigned positions as if they were temporary workers; and it doesn’t even matter that the very best player in camp might not be on the opening day roster. What matters is that the guys in the locker room are buying what the manager is selling. It could all turn out to be snake oil, and if that is the case, Kapler will leave town looking like a fool – and general manager Matt Klentak will be riding out of town right beside him. Then again, the corny stuff that Kapler is doing might resonate with just enough players. There is also the very real chance his locker room is young enough and hungry enough to buy into the manager’s “Be Bold” credo that the Phillies will actually do some bold things this summer. And the boldest thing the club could do is place star prospect Scott Kingery on their opening day roster. At least, that should be the request of Kapler as he bangs on the door of Klentak. However, the wiser, more financially-sound move is to wait at least a couple of weeks, which would allow the Phillies to maintain control of his rights for an extra summer. It’s an intriguing argument: Here, you’ve got a manager who is selling a reach-for-the-stars attitude, while the job of the general manager is to provide hope for the here and now, as well as set the team up for a longterm string of success. Aside from the NFL, the recent trend in sports is to follow what might be termed a “Sixers Lite” plan in which an organization builds for the future while sacrificing some victories in the present. Mind you, it’s never the scorched-earth method used by the Sixers, but there are some sacrifices along the way. And it's beginning to look like Kingery will be one of those sacrifices – it really isn’t much of a sacrifice when you consider that the club will only have to keep him off the big-league roster for a few weeks to earn an extra year of control. In the meantime, it would be nice if Klentak made some moves to make sure Kingery has a spot in the lineup at third base or – preferably – his natural position at second base. Kingery has already shown a willingness and ability to play different positions – good for him – but you have a talent such as Kingery, you should play him at his strongest position to provide a solid foundation to his career, and that would be second base. Meanwhile, the club’s ace is expected to be recently-acquired Jake Arrieta, who is scheduled to make his first start of the spring on Thursday. Arrieta has made it very clear that he is on the same page as Kapler – that this “rebuild” can be done quickly. First, there's the obvious talent upgrade he brings, as a guy who has a proven record of winning at the highest level. Immediately, he gives the Phillies what should be a stopper. Secondly, his optimism is something that should help a young team and staff develop. The addition of Arrieta is the opposite of the “I’m here to fatten my wallet” approach that surrounded closer Jonathan Papelbon when he joined the team. Although Papelbon ran up some pretty good numbers with the Phils, he never provided as much “I’m happy to be here” as Arrieta has in just a few short weeks. The starting rotation is now at least capable of getting any game to the point where the bullpen has a chance to save the day. There has always been the belief that the Phillies will have enough offense to hang with most teams. 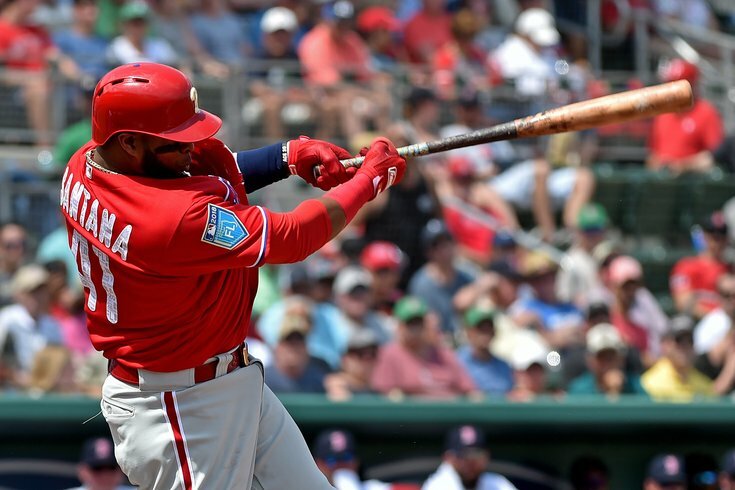 By adding Santana in the off season, and having a full season of Rhys Hoskins, the Phillies have a couple of hitters who can not only hit, but will also provide a model of how to approach a plate appearance with a plan – something that hitting coach after hitting coach has been unable to translate to the team in the recent past. In other words, it's at least going to be fun to watch. So when you look out the windows and see the latest replay of this never-ending winter, remember that Villanova is rolling through the tourney; it’s only a few weeks until the start of the playoffs for the Sixers and Flyers; and the Phillies should make April – and, for the first time in years, much of the summer, as well – a lot more enjoyable for Philly fans. Oh, and Carson Wentz is already throwing the ball, and looks like he’s getting stronger by the day.